This is a scenic run through a semi populated valley and small canyon as you approach North Fork. North Fork is a likable small town with a hotel and other basic neccessities. Start in the town of Salmon and take the river north. There are several river braids and channels in the open valley north of Salmon. Many of these channels can be run. When in doubt follow the majority of the flow. Fishing is still good here but not as good as upstream near Challis. For a more rapid filled run look at running from North Fork to the Middle Fork or Corn Creek area. The section of river from Lemhi Hole to Carmen is super popular in the summer. Expect lots of kids floating in inner tubes. 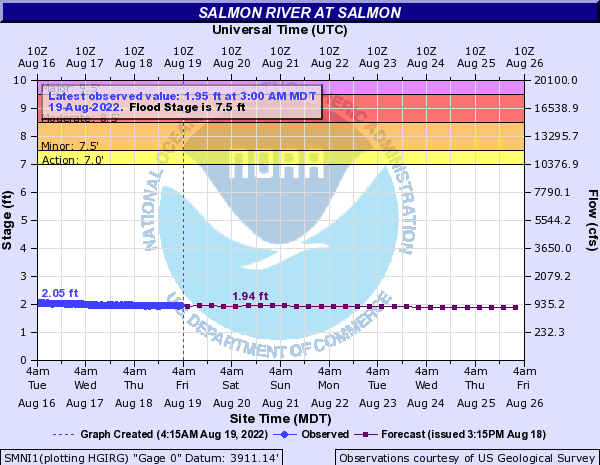 There is a primitive access point on the west side of the Highway 93 bridge about 5 to 6 miles north of Salmon. This is the first place the road crosses the river north of Salmon. This is a good take out for tubers. This area has camping, a ramp and water. There is also a fee. You need to access this from Diamond Creek road since it is on the west side of the river. Tower Rock is a nice facility although it lacks shade. It has concrete ramp and parking with camping. This is a fee area as well. Another primitive access point and site. In the small town of North Fork behind the main building there is a ramp where the North Fork confluence is. Inquire on the property the best way to access the river.